Marcus Bontempelli has always had that Renaissance-artist feel about his name. On the field he has definitely been the Bulldogs’ Renaissance-man. Arriving at the club at the end of some dark-ages, he became largely responsible for leading his team towards the light which was the 2016 premiership. Leonardo da Vinci painted ‘ The Adoration of the Magi ‘ in 1481 and only his patron and a privileged few were able to view his masterpiece. In 2018 with the help of social media and football websites, The Bont phenomenon is known at least Australia-wide. The Bont-brand of a humble, skilled champion is everywhere. Luke Beveridge said before the match that The Bont had a steely, determined look in his eye before he ran out on the field. Luke indicated his acting-captain feels the huge responsibility of leading his team to victory after a disappointing year. Leonardo’s famous painting was an unfinished piece of work after he moved on to a different patronage. In the Bont’s case, his unfinished business is all about his team challenging for another premiership as soon as possible. Tonight I will be on Bont-watch. 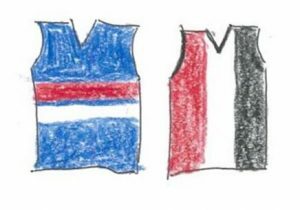 Will the artist now known as The Bont lead his team to victory for the first time since 29thJune? In doing so, will he create his own masterpiece on the field? The commentators remind us what we already know and don’t want to hear. The Bulldogs and St Kilda have the worse goal-kicking records of all clubs. For most of the first quarter the Bulldogs live up to this unwanted reputation. Instead of starting well as in previous weeks, they kicked five points only to the Saint’s four goals. Alan Richardson was already looking forward to being on Fox Footy’s 360, thinking he would avoid the usual grilling from Robbo. And Geelong lost as well so sitting opposite Chris Scott would be all the sweeter. Even The Bont missed a fairly easy shot for goal making me wonder why I was sent to praise him on this night. Our most accurate shot for goal after perhaps Tory Dickson, Josh Schache, also managed to hit the post and sent Bulldog supporters further into the doldrums. Some things never change. The injury to a Bulldog player. This time Roark Smith early in the match. To be fair I think the Saint’s player Battle was also off the field injured, leaving them without a back-up ruckman. The second quarter looked like more of the same and I was definitely thinking of a different title for this report. The artist Bont had barely unpacked his brushes. Gresham kicked the first point for the Saints but was quickly followed by team-mate Seb Ross for a goal. As the black-cloud of defeat descended over me and frightened cats and dogs wisely left the room, I began to compose a different theme for this report. Something to do with the lack of goal-kickers at the Bulldogs and the need to recruit players for specific positions. And then came the break-through! Second-gamer Fergus Greene marked and kicked the first goal for the Bulldogs. Not long later Lin Jong and Jackson Macrae goaled followed by our wonder-forward Josh Schache. Who said we need more goal-kickers! Tory Dickson scraped one through as well as a long bomb courtesy of Lachy Hunter. But no sign of The Bont as yet. Maybe he is just preparing his palette in readiness for a cameo-performance. The third quarter was the Bulldogs’ quarter. Bont the artist emerged with splashes of colour and not just dabs of pastel here and there. He was suddenly Jackson Pollock in a room full of still-life painters. Four goals to turn the match on it’s head and to justify my theme for this report. A 45-point lead going into the final quarter when 45 points in total for previous matches had been the norm. The final quarter was just going through the motions of inevitability for both teams. The Saints trying to avoid further damage and the Bulldogs knowing they would be singing their club song in 30 minutes time. Few goals were kicked and even The Bont had packed away his brushes and easel. His work here was done and will be remembered for his artistry tonight in the years to come. You select such a fine, fine muse, N Anderson. Happiness is watching M Bontempelli play footy. It’s nice to see you back here and read your article. Your views on Bonti in artistic are beautiful as well as his goals. Bonti was too good and stole my heart. I wish Jack Billings performed like his peer of Bonti. I watched the part of the game live but didn’t realise or did forget about Battle’s injury. Tom Hickey has been injured at the game. Billy Longer had already been injured as well as had Josh Bruce. Who will be our ruck on Friday night against Essendon? Carlisle or Gilbert? I am wondering now. Forgot to mention how Bonti was seen in Martin Flanagan’s “A Wink from the Universe”. He is a great player as Ted Whitten. Bonti has already been the Bulldog legend. Nice story, Neil. And how much easier it is to write, after a win! On we go, year after year, enduring the lows, clinging onto the wins – and I sometimes wonder “Why do we bother?” What is it all about anyway, in the long run?” Keep enjoying! Thanks David. I still have a copy of one of your windmill photos saved. We have just moved to another property near Warrnambool and there is ‘pretend’ windmill in the front garden which we will use as a sign-post for visitors. Selecting a fine muse has a nice ring to it. I doubt if Bont the artist needs any inspiration from a muse. It would be nice to be taken into his confidence though. Yoshi I wish it was another team rather than the Saints that the Bulldogs managed a win against. I want our two teams to play finals regularly and win premierships in the near future. Apart from the Bulldogs win in 2016, the Saints and Bulldogs are pretty evenly matched with their win loss-loss ratio and of course success or lack-of over the journey. I have put in an order for Martin Flanagan and Bob Murphy’s new books for my birthday. Jan. I didn’t think you would still be asking ‘what’s it all about?’ just revisit some of the Almanackers’ stories of why they started barracking for their various teams. The question of why we persist in supporting our team when losing becomes the norm and finals are out of the question is a bit harder to answer. You are right about us finding it easier to write a match -report after a win. Guilty as charged. My excuse for not writing during this Bulldog -horribillus year is because we have recently shifted house or farmlet which we should have done years ago when I was a much younger man. Hope your Swans make the finals. Just a very broad term “What’s it all about”, Neil. And not necessarily about footy. Life generally, and the perspective that we must put in its place at all times. Bla bla! !